In the past decade, fluoroquinolone antibiotics have gained broad worldwide acceptance for the oral and intravenous (IV) treatment of a range of infections. These antibiotics act by inhibiting DNA gyrase-an enzyme required for bacterial DNA replication, transcription, repair, and recombination-and are active against gram-negative and gram-positive organisms and atypical pathogens, such as Chlamydia pneumoniae and Mycoplasma pneumoniae. Although they are generally very safe, fluoroquinolones as a class are associated with phototoxicity, seizures, and hypo- and hyperglycemia (the latter usually occur in diabetics receiving oral hypoglycemics or insulin). Also, fluoroquinolones form a poorly absorbed chelation complex with sucralfate and divalent cations (calcium, magnesium, iron, and zinc, and also aluminum). Drug resistance is a growing problem, primarily for hospitalized patients with nosocomial infections caused by Pseudomonas aeruginosa, Acinetobacter spp., Serratia marcescens, and, particularly, methicillin-resistant Staphylococcus aureus (95-100% are resistant in some centers). Fortunately, resistance is still rare with common pathogens found in the community. Recently, the FDA approved two new fluoroquinolone antibiotics: Rhone-Poulenc Rorer’s sparfloxacin (Zagam) and Ortho-McNeil’s levofloxacin (Levaquin). Both are long-acting, broad-spectrum, and well-tolerated antimicrobials. 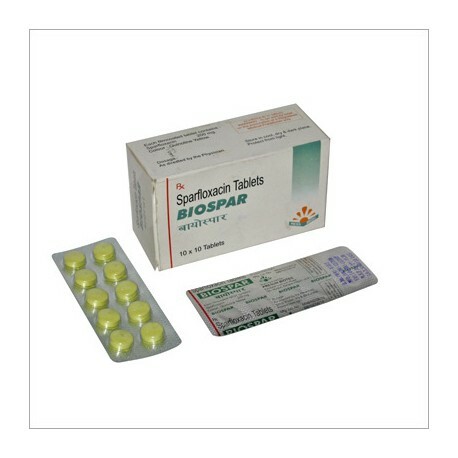 Sparfloxacin is a chemically novel quinolone developed in Japan by Dainippon. It is indicated for the treatment of community-acquired pneumonia caused by C. pneumoniae, Haemophilus influenzae, H. parainfluenzae, Moraxella catarrhalis, M. pneumoniae, and Streptococcus pneumoniae. It is also indicated for the treatment of acute exacerbation of chronic bronchitis caused by the above organisms or by Enterobacter cloacae, S. aureus, and Klebsiella pneumoniae. Sparfloxacin is expected to be especially useful against penicillin-resistant S. pneumoniae and multidrug-resistant H. influenzae and M. catarrhalis. Rhone-Poulenc Rorer is also studying the use of sparfloxacin for acute maxillary sinusitis, skin infection, and complicated urinary tract infection. In clinical trials, sparfloxacin (Zagam) was comparable to erythromycin and cefaclor for clearing community-acquired pneumonia. Eradication rates ranged from 83 to 97% for sparfloxacin, depending on the pathogen, and from 76 to 100% for cefaclor. Erythromycin cleared 75% of C. pneumoniae infections and 90 to 100% of other infections. Another trial found sparfloxacin at least as effective as ofloxacin (Floxin/Ortho-McNeil) for acute exacerbation of chronic bacterial bronchitis; clearance rates ranged from 82 to 100% for sparfloxacin, and from 80 to 97% for ofloxacin. Sparfloxacin (Zagam) is administered as two 200-mg tablets the first day, followed by one tablet daily for 9 additional days. The drug is well absorbed orally, with peak plasma concentrations occurring 2.5 to 4.5 hours after single oral doses of 100 to 400 mg. Sparfloxacin can be taken with food, milk, or caffeine-containing products, although patients should delay taking supplements containing calcium, iron, or zinc until 4 hours after taking the antibiotic. They should also delay taking sucralfate or antacids containing magnesium or aluminum (administration of an aluminum-magnesium suspension between 2 hours before and 2 hours after sparfloxacin administration reduces oral bioavailability of the antibiotic). Sparfloxacin (Zagam) is widely distributed; in animal studies, drug concentrations were 2- to 10-fold higher in tissues than in plasma (except for brain, cerebrospinal fluid, and testes). Elimination is primarily renal; half-life is approximately 16 to 17 hours. Patients with renal dysfunction should have the dosage reduced. The most common side effects in clinical trials were gastrointestinal (nausea, diarrhea, dyspepsia, abdominal pain, and vomiting in about 1-5% of patients) and neurologic (dizziness, lightheadedness, headache, and insomnia in about 1-4%). In comparative trials, adverse gastrointestinal events were more common with erythromycin (about 15-16%) than with cefaclor and sparfloxacin (about 2-4%). The most serious side effects were phototoxicity and cardiac arrhythmias. Mild to severe phototoxic reactions occurred in almost 8% of 1,585 patients in clinical trials after exposure to direct and indirect sunlight, or artificial ultraviolet light. These reactions occurred even when the light was shaded or diffuse (e.g., exposure through glass or during cloudy weather), and even when sunscreens or sunblocks were used. Even when sunblocks are used, patients should avoid exposure to direct or indirect sunlight during therapy and for 5 days after drug discontinuation. Another potentially serious side effect is the prolongation of the QTc interval. Although small in magnitude, this has resulted in torsades de pointes when sparfloxacin (Zagam) was given with other drugs that also prolong the QTc interval (disopyramide, amiodarone).